The best thing about book boxes is it’s like Christmas in a box…ANY TIME OF YEAR. And I freaking love boxes. I used to collect them as a kid (who care what’s inside) and this brings to my attention that I might also be a cat. But anyway. 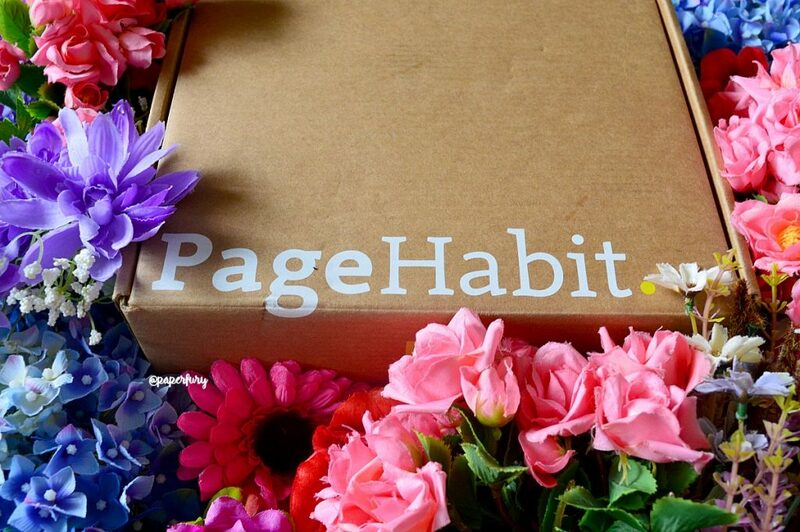 I’m doing an unboxing of the latest @PageHabit book box! I’ve only just started dong some unboxing reviews here on the blog, but usually you can catch them on my instagram. You can catch a lot of things on my instagram actually, like me obsessing over Maggie Stiefvater books OR me posing like a dead bird in interesting socks OR you can even catch insanity. It’s very fun. 10/10 recommend following me. There are a ton of book boxes out there yadda ya, but what makes PageHabit special!? THE AUTHORS ALWAYS ANNOTATE THE BOOKS. Insert me + heart eyes = here. 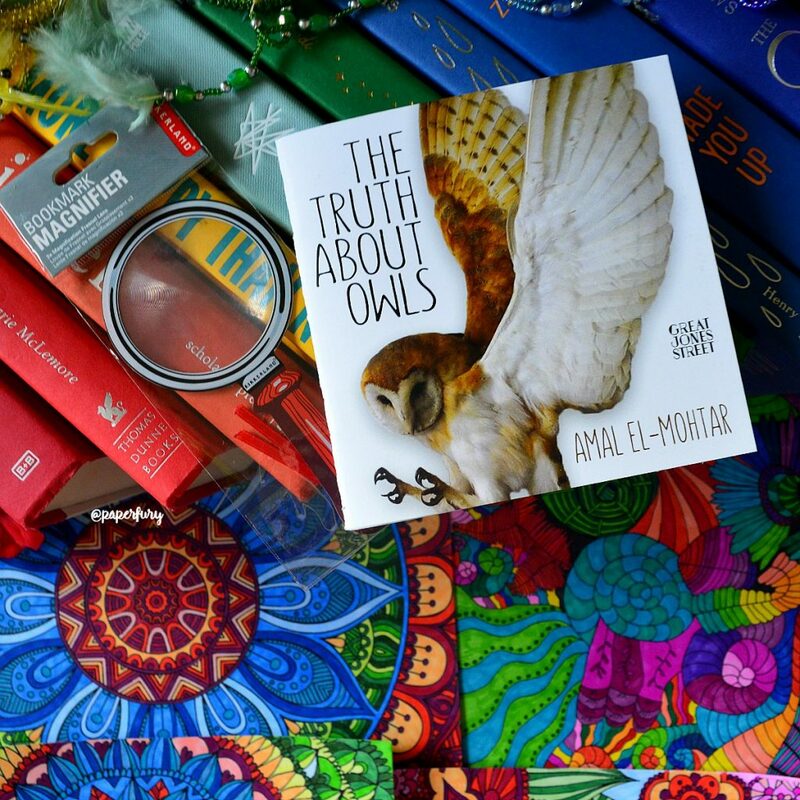 Part of the proceeds of these boxes also go to help promote children’s literary in underprivileged countries! I’m actually the cutest affiliated promoter of these boxes you will EVER meet. You love me. So if you want to buy a box, use my special link and I will also then love you back. Also fun fact: you get FREE shipping (or $5 off for INT) on your first order if you use my code “PAPERFURY”. Haven by Mary Lindsey, which is ANNOTATED of course! Plus a cute letter from the author! 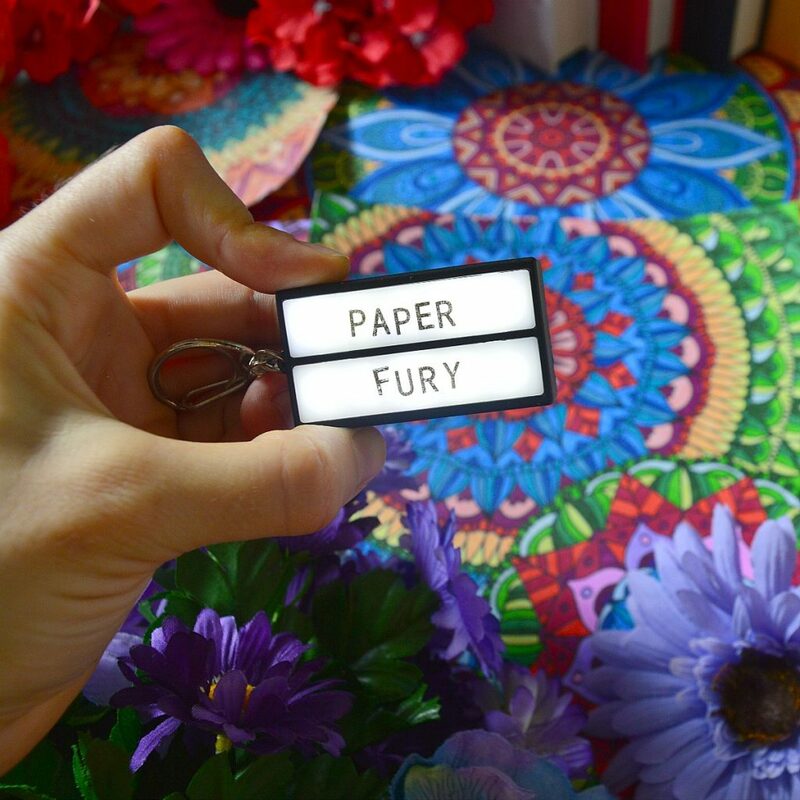 Light box keychain that you can make spell whatever you want! 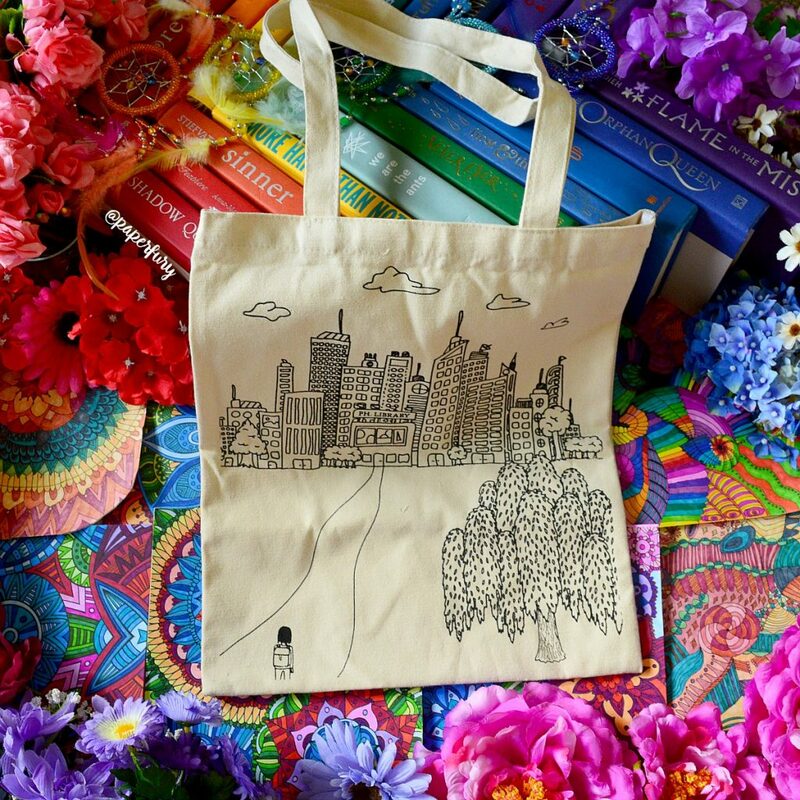 Super sturdy and cute book bag with city + library design! Packing that kind of looks edible — OR SO MY DOG THINKS AND I HAD TO BREAK IT TO HIM THAT NO. 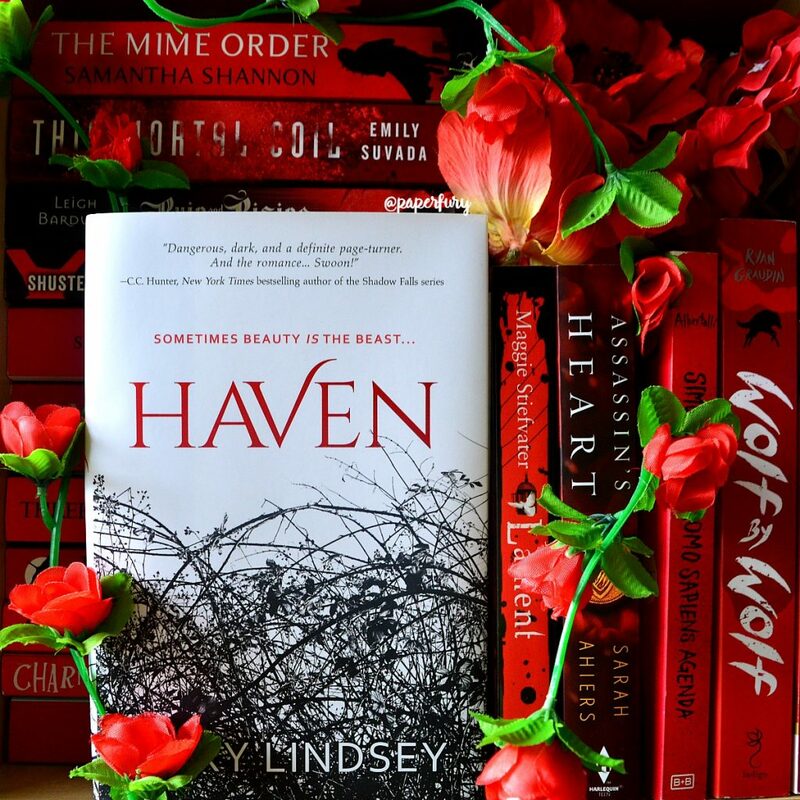 The featured book is Haven by Mary Lindsey. And I admit, I had not heard of this one before which is actually terrifying because if I haven’t heard of a book…what have I been doing?!?? * My very favourite thing is when people say, with a very flat 1000% done face, “Cait I literally cannot look up a book on goodreads without finding you’ve already reviewed it.” I HAVE NO LIFE OKAY. JUST BOOKS. Anyhow. Haven was both (a) a delightful surprise, and (b) full of paranormal weirdness and evil magical cookies. I actually really like finding these hidden gems! And also it’s nice to know Pagehabit picks hidden-gem-books because there’s so much less risk of me already having bought it. 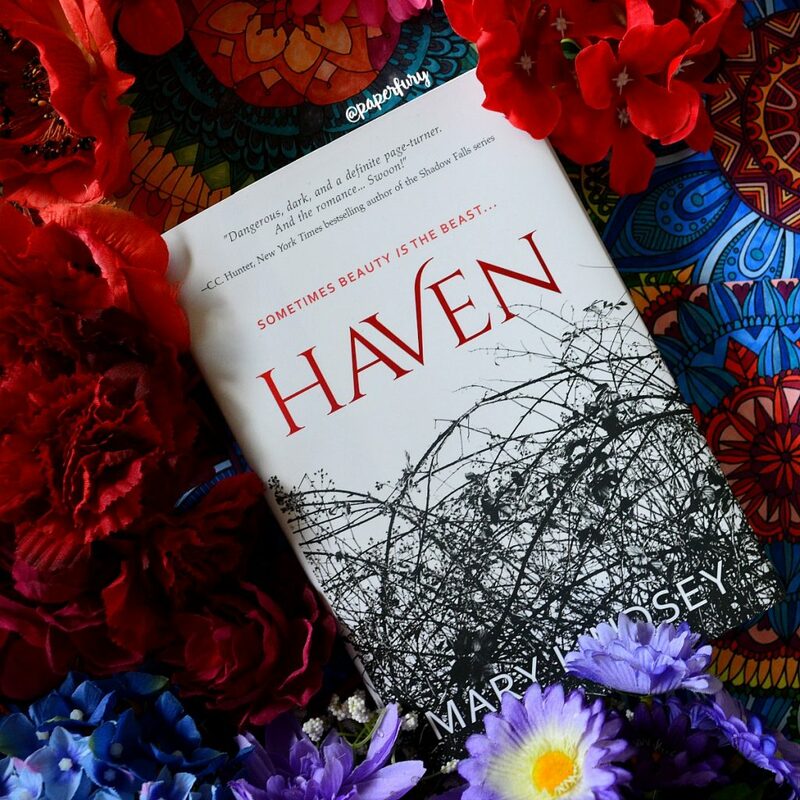 Anyhow, Haven is basically a story of a boy named Rain who goes to live with his aunt in a super creepy little town where everyone turns out to have supernatural paranormal secrets. Apparently this is usual for small towns? Which is GREAT news because I live in a tiny town and I swear if the cows don’t turn into aliens or werewolves don’t bust out of the forests SOMETIME SOON I’M GOING TO LOSE MY MIND. Excuse me. * Um probably writing. I legit spent the last six months scrawling out words at maniac speed and also eating a wall. So yes. It twisted a lot of the “cliche” stereotypes by having a boy narrate! I saw someone call this a “reverse Beauty and the Beast” and like that totally makes sense?!? I knoooow a lot of people think paranormal is dead, but I actually really like it! I also seriously like werewolf books because the mythology is super interesting AND I like dogs. The love interest, Freddie, is really badass and when Rain confesses he’ll die for her, her #1 reaction is: “Mate, you need help.” I LOVE HER SHE TOOK NO NONSENSE! There’s a lot of blood. And some very bad wine and very bad cookies. The book has such a sinister vibe that it really was super captivating. Perhaps it wasn’t extremely original and it was a bit heavy on the smexy, but it was lots of fun and there are tons of conspiracies and mysteries to unwind and the occasional dead body for the mortician to get excited over. Also I SO enjoy reading the author’s notes throughout the book!! It’s like a “behind-the-scenes” sneak peek and it’s endlessly interesting! This is great because I’ve always wanted to be Sherlock Holmes and hopefully I can whip this out when anyone doubts my career path. Also I guess you could use it on actually words and not just to look like a pretentious Holmes detective??? But I don’t know, that seems weird. I think these seems MARVELLOUS because I love owls! I love how they only go out at night and all they do is like…find food. This seems so relatable. Also that owl on the cover is very beautiful and looks like Hedgwig and — OH WOW. PAINFUL MEMORIES…EXCUSE ME A MOMENT. So you can actually put your own words into this and I chose “Paper Fury” because I’m self-obsessed. I also made the letters crooked on purpose…haha hah HAHAHA HA. Yes. Please believe me and not that I have poor coordination skills. Anyhow, it lights up when you click the button and I assume this will also come in handy as a torch for when I’m lost in dark forests searching for werewolves under the blood mood. As is normal. I think the design is super cute and I hugely relate to the small figure looking at the city and trying to weigh up whether it’s worth facing people in order to get to the library. UGH THE SACRIFICES WE INTROVERTS MAKE. Also it’s so sturdy?! I’m pretty sure I can fit 50 tonnes of books in here no worries. I should probably test it out though, right?? December’s book is a “twisty-turvy suspense you won’t be able to put down” which sounds super promising and also exactly how I describe my cooking also. Also just in caaase you don’t want a YA box, they actually have a ton of different genres and categories to check out. Also “PAPERFURY” = free shipping in the US. Don’t forget! Also these would make a great Christmas present?! For…like yourself. You deserve it. And don’t forget ALL their books are annotated by the authors!! right so how do you feel about paranormal?? do you think it’s ready for a comeback? (tell my your favourite paranormal creature or one you’d like to see more of?) 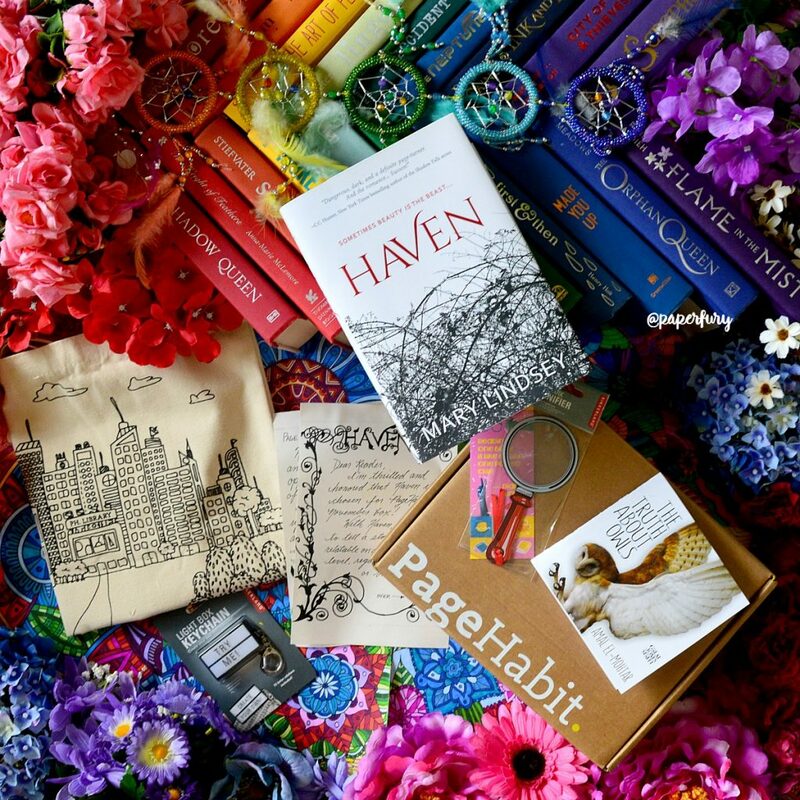 and have you ever tried a Page Habit book box?? Aww THANK YOU. I really enjoy doing these posts so I’m glad they’re entertaining!! Also I’m totally all up for paranormal creatures. 😍 Faeries and witches and werewolves = so so much yes please. I think it’s a genre that needs a comeback! *whispers* Make it haaaaappen, Kara! Awesome! I actually signed up for my first box last month because of your blog. I went with the mystery box because it’s what I read most of these days and I loved it! So, THANK YOU! Also… are fruit mince pies anything like what we call mincemeat here in the US? I don’t care much for mincemeat pie, but my mom makes the best cookies out of the filling! Yay! Glad I could make you happy! As for why they call it ‘meat’, I have no idea! Maybe because it looks like ground hamburger? Made me not want to eat it as a kid. Hahaha. Nooo that is a pain! I think it’s $5 off for INT orders though? But probably that doesn’t cover all of shipping. 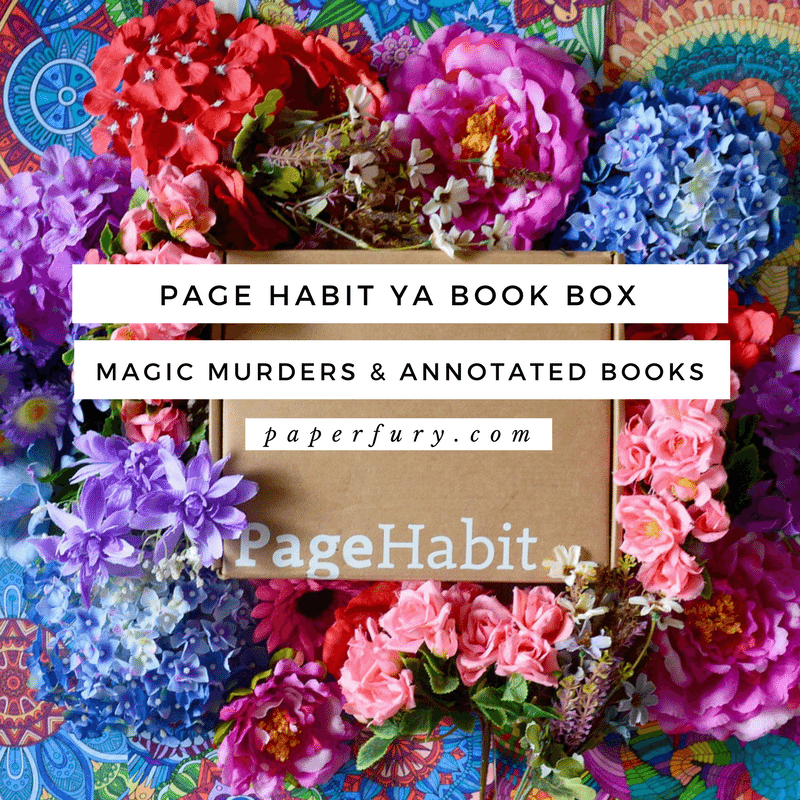 I’ve actually been eyeing PageHabit for awhile mostly because I love the idea of the authors annointing the books with the little extra bits of information, but I have a one subscription box at a time rule or else I’ll spend way to much money and my OwlCrate subscription is still active. So. Maybe in the future. And I haven’t heard of Haven either? Typically in December at the end of every year I go through the Goodreads list of YA releases for the next year but I either missed this one or it was announced in 2017. I don’t know. But hey, a book with cookies! You tell me that a book has a lot of food in it and it’s almost guaranteed I’ll read it. I appreciate that you read the book and reviewed it before doing this post. You are the reading flash, so it probably didn’t take you long, but that’s a nice addition! When do we see more unboxings??? I’m here for them and your snarky, witty reviews!! Yessss. 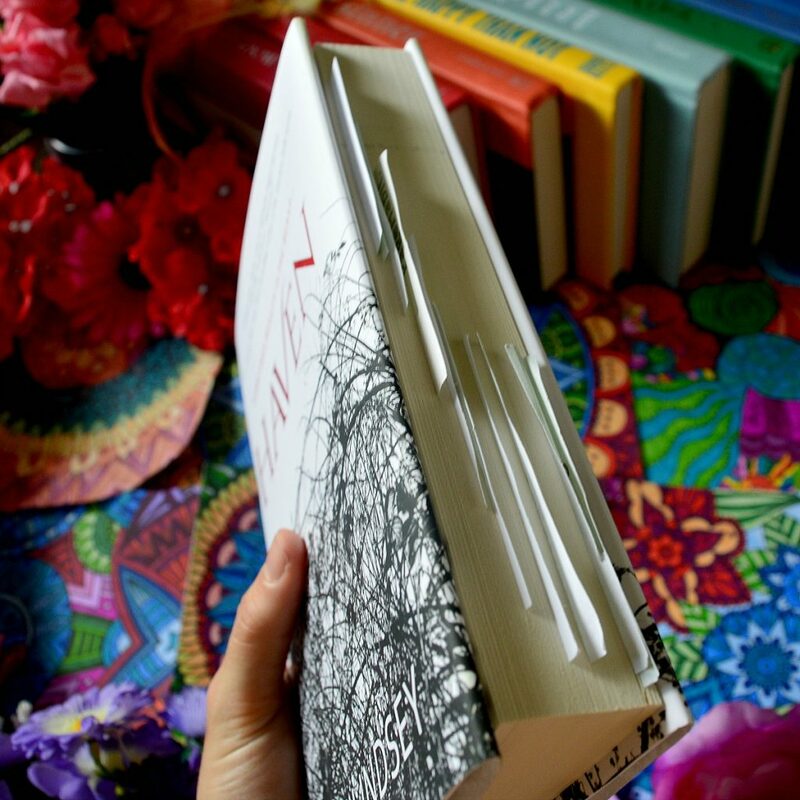 I would love EVERY book of ever with author annotations because it’s so cool to have like sneak peeks like that?! I think fae count as paranormal and I love them too!! I actually never got over-saturated with vampire books, buuuut I also don’t run out for them.😂I prefer werewolves because dogs are good puppers. I LOVE BOOKISH BOXES SO MUCH! But they’re usually too pricy for me, so I’m happy with reading/watching others unbox them! I think that the author annotations are the coolest in the world and I love the tote bag!! I do understand!! It’d be nice to be rich and able to afford aaaall the things right?! Super glad you enjoy my unboxings though. <3 YOU'RE LOVELY. I haven’t read paranormal in a while. I guess, for me, it could have a comeback (I’m not overly saturated with werewolves and vampires at the moment). The subscription boxes look cool, but… it would be prohibitively expensive for me, what with the shipping (plus the “handling” fee that Canada Post has charged on my last few international shipments; so adding the $10 “handling” fee, plus taxes, brings it up to almost $60 for the monthly box… and then it makes more sense to just go to the bookstore). I like the idea of the annotations, though; that’s pretty cool. It would be interesting to get that behind-the-scenes peek! I didn’t really get drowned in vampires/werewolves when it was “big” either because I wasn’t reading a lot of YA at that point? So I’m lucky to have escaped that.😂 Plus I think quality of these old tropes IS improving so that’s great! Ahhh I STILL HAVEN’T GOT MY NOVEMBER BOX. It’s in LA apparently. #really #salty I mean I asked for a box to review in OCTOBER DUDE and then there were no YA books boxes left for October so I asked them to wait until November to send me the Nov box and HSK<J bKUA DGhvI AM WAITING. I HAVE NO PATIENCE. Maybe it'll arrive on Christmas so then it will be even more special. MAYBE. But I dont have time for this honestly. And the book is Haven? I MEAN SORRY FOR THE SALT but I have been waiting for my box for FOREVER OKAY and then it's not even. a book. i'm. excited about. UGH. DISApPOINTING MUCH. I mean gosh I AM SALTY TODAY buttt I'll give the book a chance! IT MIGHT BE EXCITING AND GREAT AND SUPERB so who shall know! Maybe I will love it! OOHH THE KEYCHAIN ACTUALLY LOOKS SO EPIC. and I LURVE tote bags. So. Much. And a bookmark magnifying glass, oooh. enticing. I actually really like these unboxings? They're super cool. I shall stop being SALTY SORRY. I just finished Haven today and loved it for all the reasons you just mentioned. This sounds like so much fun! I love the idea of the annotated books. And Haven sounds cool—like Stranger Things meets X-Files! Ack, I want to order this book box now! “Cait I literally cannot look up a book on goodreads without finding you’ve already reviewed it.” I HAVE NO LIFE OKAY. JUST BOOKS. And I’m kind of glad when you review books ahead? You can warn us about horrible books to come or simply books that are not your style. And about Paranormal… I don’t really read much of it. Maybe I’ll try to if I’m not too scared. That lightbox keychain is brilliance. That book bag is beautiful!! It’s so beautifully designed ahh!! So I kind of want paranormal not to be dead? A week or so ago I realised I was in a definite ~mood~ for paranormal, so I got out this book from the library that was a paranormal romance I thought would be good… and it’s not? But maybe Haven is the one for me? Maybe I picked the wrong one! I AM OPEN TO SUGGESTIONS if you have any. What is YOUR favourite paranormal book, Cait? Also, I love the idea of this book box. 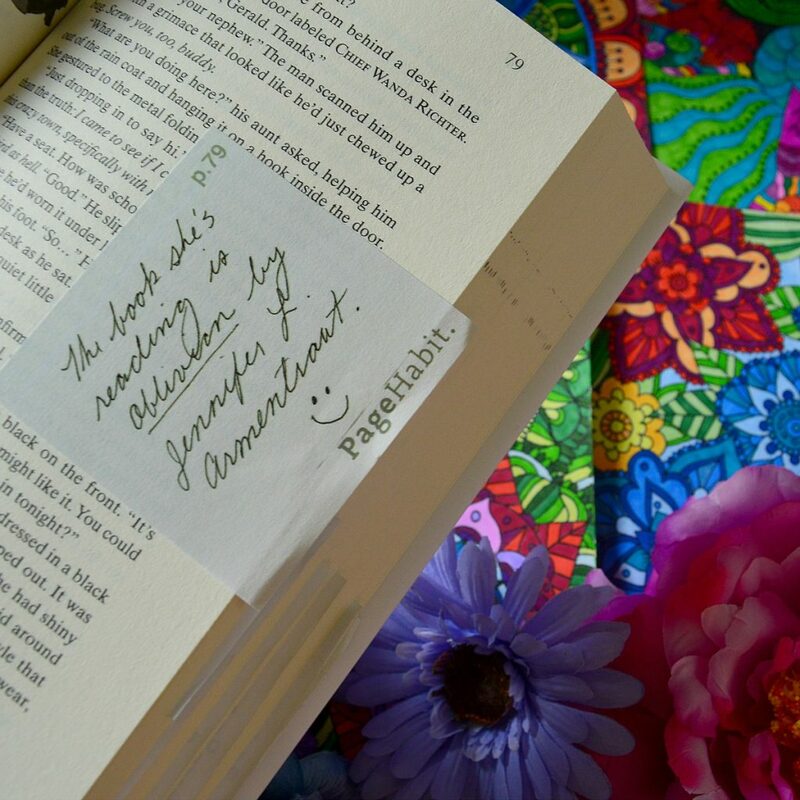 I have never gotten an annotated book before but I ADORE the idea of them. And every single one is annotated? That is INCREDIBLE. Also, the little extras are super cute. I probably would have put “I love cats” in my light box keychain if ti would fit because that’s on brand for me. I’M GLAD YOU’RE WTIH ME ON THIS YAY!! I think there is a sheer ton of crappy paranormal out there, but like storytelling is widely improving and honestly I want to see some diverse and minority authors actually taking hold of this genre, because I think it could be revamped absolutely beautifully. I adore the White Cat series by Holly Black. (Actually all the Holly Black.😂) And the Game of Love and Death was amazing!! I’m glad my post got you to go find and read it!! That’s really amazing and I’m so glad you enjoyed Haven!